In Berlin, the Amano group is known for one wildly popular venue: the Amano Bar, a rooftop hot spot at the Hotel Amano that’s frequently featured in travel magazines — usually highlighted in bold text beside an image of sunset views of the city skyline. This is something a little more low-key. 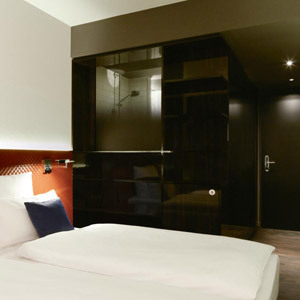 Located nearby in the Mitte neighborhood, Hotel Mani is the Amano’s smaller, quieter sister, with just 63 rooms. 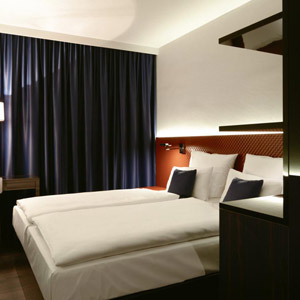 The same well-established Berlin firm, Esther Bruzkus Architects, designed the elegant interiors at both hotels. At Mani, their approach feels less formal and more intimate — instead of a grand lobby lounge, there are cozy nooks with leather chairs and well-stocked bookshelves. Guest rooms are frankly minimalist, soundproofed and pristine, with shining parquet floors and leather accents, high-end German showers instead of bathtubs. Just as at the Amano, everything you lay eyes on looks like the best money can buy, from the polished marble facade to the smooth linens, from the designer desk chairs to the top-of-the-line technological amenities. Speaking of which, should you decide to travel light, you can borrow an iPad or a laptop — or something more indulgent, like an XBox — at the Mani's front desk. Unsurprisingly, you won’t find oversized platters of bratwurst and spätzle at the sleek Mani Restaurant, but Parisian-inspired cuisine inflected with spices from the Far East. In warmer weather, dine on the leafy patio, and in wintry months, cozy up with drinks by the fireplace. And while fine dining is all well and good, there are only so many meals in a day. Considering the hotel’s perfect location in the middle of the action in Mitte, one of the Mani’s most appealing amenities is also one of its simplest: bicycle rental at the front desk. Who needs an XBox, anyway, when you can explore Berlin on two wheels, iPhone loaded up with the hotel’s recommended navigation system?